This panoramic picture was taken just days after I'd closed on the house in February 2004. I spent an entire day listening to Tower of Power and scrubbing grime off of the walls. It was very apparent from the markings on the walls that the basement had recently been subdivided into tiny apartments, no doubt to house a burgeoning immigrant population. My first "lazy Sunday" project in the house was to convert a set of basement shelves into a bar. I started by tearing the backs off of shelves, to let some light into the dark corners for my housewarming party in June 2004. Next, I completely tore out the shelves so I could carve hollow grooves into the sides to house the electrical wiring for two fancy lights. The pool table arrived in the summer of 2004, and I bought a slick pool table light off of Yahoo for about $120. Work then lagged for a year while I spruced up the parts of the house that I actually lived in, and renovated one of the guest rooms so Kathy could freeload for a summer. Next up (in the summer of 2005) were some classy jazz posters in frames that were 50% off at Michael's and one of my parents' cast off TVs (they tend to cast off a TV every two and a half months or so). During the last half of 2005, I put the basement to good use, hosting (and losing) multiple poker games, throwing a wild and crazy Halloween party, and starting the tradition of a "Month of Thanksgivings", where I invite a different batch of friends over every weekend in November for turkey. I didn't do a damn thing to improve the basement in 2006, although my dad snuck into my house while I was on vacation at the beach to finish my bar. I did host another "Month of Thanksgivings", followed by a St. Patrick's Day extravaganza in 2007, but I was too busy painting my upstairs bathrooms the colour of an 80s glam star's vinyl jacket to renovate anything in the basement. 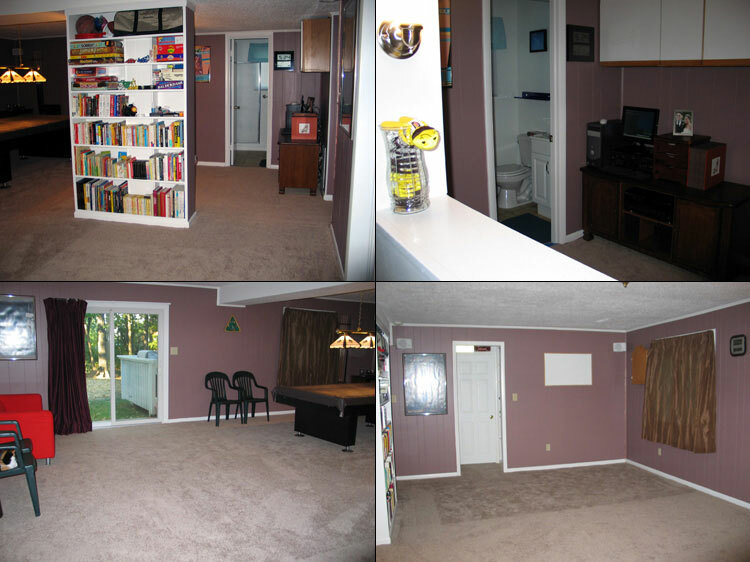 When September 2007 rolled around, I had finally finished working on all the other parts of the house and had time to focus on the basement. Rebecca helped me pick out paint (milk chocolate), replacing my old seeing-eye-dog, Anna, who is now married and has her own paints to worry about. After a couple days of painting last month, my dad and I faced the hairy task of moving the pool table so we could lay carpet underneath it. We accomplished this in a cost-effective manner by raising it up on two dollies from Costco (and then returning them for a full refund afterwards). The new and improved basement features a wall of mounted mirrors, four high-tech speakers on the walls (such that when you stand at the focal point of the sound waves, Pimpin' All Over the World can burst your ear drums), new curtains, and a calico cat. It's all done!